3D image of the Gulf of Mexico depth-to-basement SEEBASE showing the Campeche Shelf (lower left) and Yucatan Platform with the Chicxulub crater (top right; shallow basement indicates the central melt zone). SEEBASE® - Gulf of Mexico SEEBASE Lite is the first commercially available seamless interpretation of basement architecture covering US and Mexico permit areas for the Gulf of Mexico, revealing pre-salt Triassic-Jurassic rifts and paving the way for a new and improved understanding of its petroleum systems. The study provides important insights into the basement-involved structural control on primary salt deposition in the Gulf, its subsequent mobilisation, and the potential distribution and thickness variations of Jurassic source rocks. "Traditionally, basement has proven difficult to image on seismic data in the Gulf of Mexico region due to widespread salt and the very thick post-rift sequence, so the new regional depth-to-basement grid (SEEBASE) represents a significant step forward in understanding the geometry of the deep basin system." Dr Karen Connors (PhD) - Frogtech Geoscience Principal Structural Geologist. Gulf of Mexico SEEBASE Lite - Digital Elevation Model showing complete product coverage of all permit areas (excluding the US Congressional Moratorium area). Gulf of Mexico SEEBASE Lite includes Frogtech Geoscience's proprietary enhancements of Core Datasets including gravity (above), magnetics and DEM. The Gulf of Mexico SEEBASE Lite Study and GIS provides an integrated geophysical and geological study of basement and basin evolution, including a hand contoured 3D model of the depth and geometry of the basement surface. The new regional depth-to-basement grid (SEEBASE) represents a significant step forward in defining the geometry of the Gulf of Mexico region deep basin system, having overcome the challenges of imaging the basement due to widespread salt and the very thick post-rift sequence. A broad rift system in the onshore northern Gulf has been interpreted, comprising a set of large graben partly filled with volcanics, while offshore a set of low-angle basement fault blocks has been interpreted in the very deep (~14-20 km) basement consistent with highly thinned crust. A large syn-rift depocentre has been revealed underlying volcanics along the Mexico margin, formed as a (strike slip) pull-apart basin during Early to Middle Jurassic rifting. These early rift basins influenced thickness variations of the Upper Jurassic source rocks. Structural analysis links the formation of Tertiary detached basins including Tampico-Misantla, Veracruz and Sureste to reactivation of deep basement structures, even though many of the overlying younger basins were not affected by through-going faults. Gravity models and the crustal thickness grid support the development of a ~300 km wide zone of hyperextended crust with low-angle fault blocks overlying serpentinised mantle across the key exploration area of the northern Gulf. The Yucatan and Eastern Mexican margins show similar evidence of hyperextension with zones of mantle exhumation . Tectonostratigraphic History: Plate reconstructions and summary of key tectonic events; implications for basin development; interpretation of major basement faults, and fault event maps for the early rifting events. Gulf of Mexico SEEBASE ArcGIS includes project ready geo-referenced, integrated datasets that can be optionally further calibrated with client data ensuring improved insights and new ideas on basin architecture and evolution, as well as a better understanding of the extent of known and new depocentres. Each SEEBASE study is designed to be project ready. 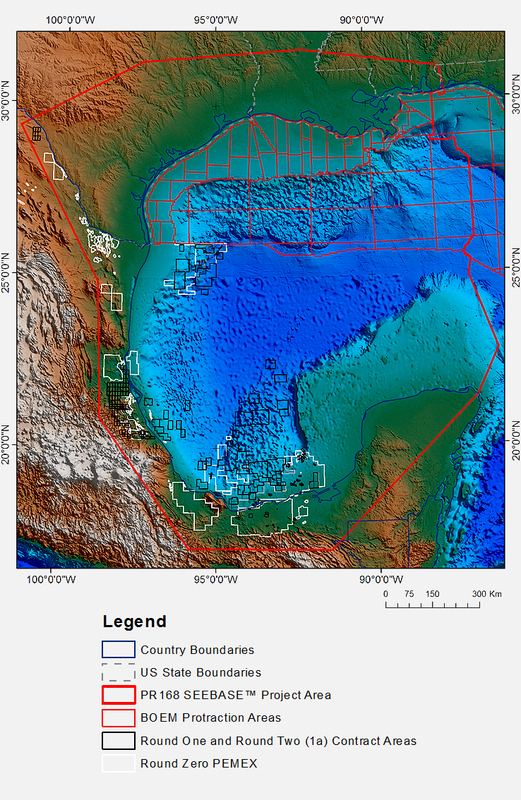 The Gulf of Mexico SEEBASE Lite Study and GIS is supplied as a fully integrated geophysical and geological study of basement and basin evolution of the Gulf of Mexico at a regional scale using public domain datasets enhanced using Frogtech Geoscience proprietary processing. The SEEBASE model of the 3D depth and geometry of the basement surface provides the first commercially available seamless interpretation of crystalline basement for the regional Gulf of Mexico and provides significant new insights into the distribution of depocentres. The study also presents a regional tectonic synthesis and interpretation that includes descriptions of basement terranes, Frogtech Geoscience plate reconstruction models, basement composition, and calculations for basement-derived heat flow. 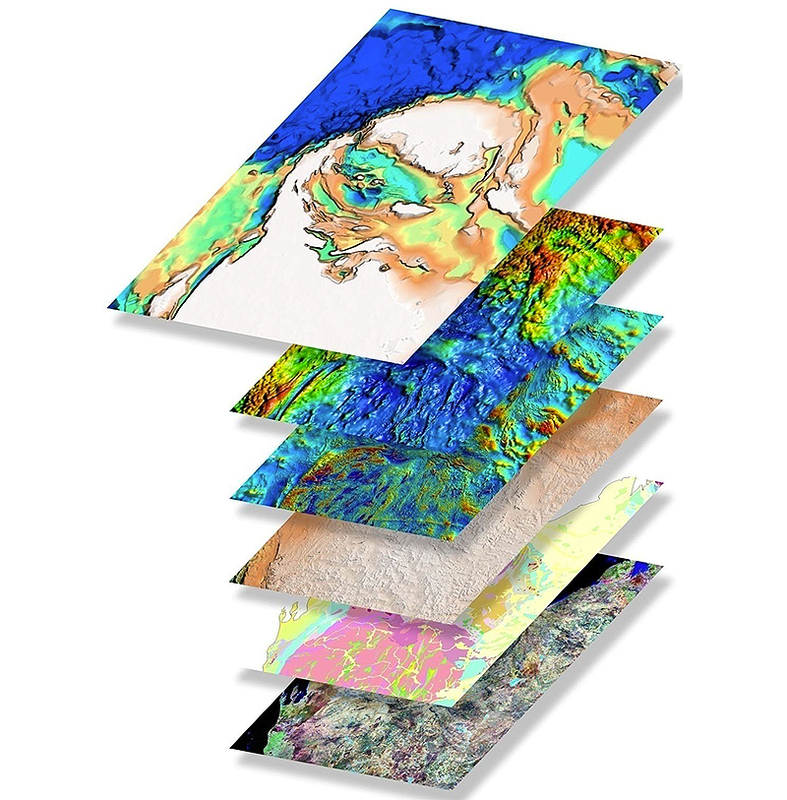 The integrated evaluation of the SEEBASE surface and accompanying Moho model highlights both the regional crustal architecture and variations in crustal thickness at a much higher resolution than available from published crustal models. These centre-piece features, along with other deliverables, make the Gulf of Mexico SEEBASE Lite Study and GIS a cost-effective regional evaluation tool that gives a first-pass perspective on the geology and regional prospectivity of this complex area providing a basis for focusing future exploration and data acquisition strategies to reduce exploration risk and underpin petroleum systems analysis. Leverage the hand-contoured SEEBASE model to understand depth to crystalline basement, rather than an automated magnetic “basement” grid (avoiding the challenges of syn-rift volcanics in some areas of the Gulf) or a base salt seismic horizon which ignores the syn-rift section. Identify, assess and use predictively, the relationship between interpreted crystalline basement architecture, basement structures and known hydrocarbon distribution. Coverage of the entire Gulf of Mexico region from the US to Mexico, highlighting the limits of the Gulf of Mexico basin system and the detailed geometry of its early rifts. Use the basement interpretation to assist re-evaluation of the distribution of Upper Jurassic source rocks, using the latest constraints for the extent of oceanic, transitional and extended continental crust. Detailed FROGNet plate reconstructions of key events provide valuable insights into the broader setting during early rift development in the Gulf of Mexico.